Victoria Peak is certainly the number one tourist destination here. The Victoria Peak provides a stunning bird’s-eye view of the world-famous Victoria Harbour, Hong Kong skyline as well as Kowloon. It is a great place for wandering around day and night, for visitors and locals alike. • Peak Tram - town station at Garden Road in Central, few blocks behind the Bank of China Tower. • Open-Top Bus No. 15C from Central Pier 7 (next to Star Ferry) to Garden Road peak tram station. • Bus No. 15 at Exchange Square bus terminus in Central. • Green minibus No. 1 at Central (Hong Kong Station Public Transport Interchange). • Taxi from Central would cost around HK$100. Peak Tram station is connected to Pier 7 in Central by open-top bus number 15C. If you want to go to the Victoria Peak, this is a great way to experience Hong Kong. Once you get off the Star Ferry, turn right to Pier 7 and the 15C bus terminus is there. 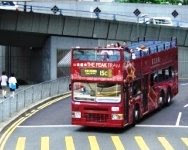 You might start your tour to the Victoria Peak by open-top bus, follow by peak tram. You can take a bus ride to return to Central. This is the most interesting route to explore the Peak of Hong Kong. Along Lugard Road at the Peak of Hong Kong, there is an extremely easy-to-walk scenic trail. This circular path offers an easy stroll with incredible views. On Sunday, even locals walk with their puppies. This is definitely a walk that should not be missed. It is sure to heighten your experience at the Peak of Hong Kong. This extremely easy and pleasant walk at the Peak of Hong Kong is about an hour. It might take a little longer if you want to spend more time on the stunning views. Lion Pavilion is a vantage point where you can overlook the beautiful city of Hong Kong across the Victoria Harbour to Kowloon Peninsula. Just next to the Peak Tram station, the Lion Pavilion at the Peak of Hong Kong is full of tourists day and night. I am sure your experience here is going to be unforgettable. Taking photos here might need a bit of patience. But you can buy service from street photographers who occupy the best photogenic spots for you. An 8R instant print would cost around HK$100. For ages, Peak Tower (Locals call it “Fools Pavilion”) has been a landmark of Hong Kong. This current Peak Tower is an award winning design. The building is highly visible even from sea level and is intended to symbolise Hong Kong. It offers one of the best views in the world and creates a backdrop to the spectacular cityscape of Hong Kong's Central district. The Peak Tower incorporates the Peak tram station, with viewing platforms, restaurants and retail outlets. Madame Tussauds features more than 100 wax works covering three floors and five themed areas. This is an interactive and absorbing entertainment experience at the Peak of Hong Kong! Above the bus terminal, the Peak Galleria is another assortment of shops and restaurants, including Café Deco, The Hard Rock Café and MacDonald’s. There is also an excellent collection of souvenirs and handicrafts at reasonable prices. Of course there are observation decks where you can admire Hong Kong at various angles. Right opposite to the Peak Galleria is the Peak Café. 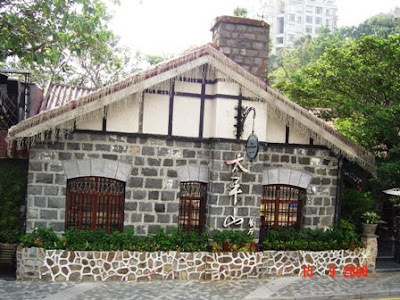 This historical restaurant is another hallmark of the Peak of Hong Kong. Its outdoor terrace offers incredible views of the city. 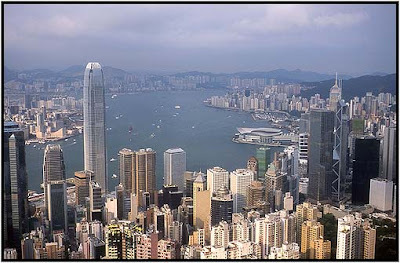 The Peak of Hong Kong is a very prestigious area where the richest people live. You might want to spend some time take a look at the beautiful houses around. The quarter of the Chief Secretary of HKSAR is located on 15 Barker Road. You’ll see it when you ascend or descend the Peak on a bus ride. Open-Top bus plus Peak Tram is certainly the best transportation to visit the Peak of Hong Kong. Peak Tram station at both Garden Road and the Peak has long queue on Sunday and holidays. Make sure to go early and avoid the crowd.